In Christmas mythology, Santa gets almost all the credit. But a lot of heavy lifting is done by the elves back in the workshop. In real life, there’s a lot of people who play that role of making or procuring the goods. Don’t these elves deserve something special? A recent visit from a pair of elves (really!) inspired this cocktail. The smooth sipping flavor of Barrel-Finished Reserve is combined with an intriguing medley of ingredients to create a delicious Christmas cocktail in red and green. If you know someone who’s taking on that role of the elf, mix them an Elf Special. Or if it’s you, mix one for yourself, elf! Add several ice cubes to a cocktail tin. 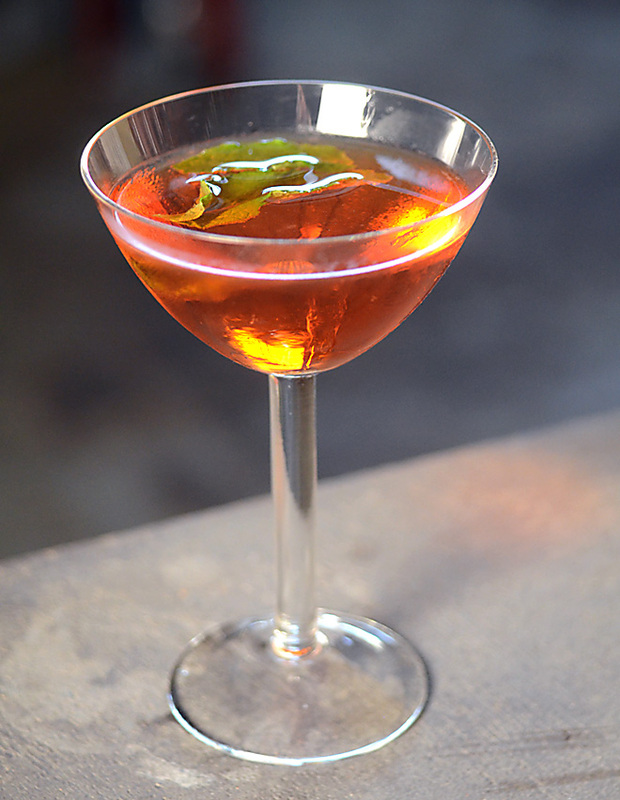 Pour the gin, Aperol, amaro, and ginger ale over the ice and stir with a bar spoon. Strain the cocktail into the glass. Add a couple mint leaves, and muddle them a bit in the cocktail glass to release the mint oils. Add a bar spoon of Toulouse Red on top and serve. *Substitutions: In place of the Aperol, another orange liqueur may be used. In place of Lucano, another amaro can be used; or a smaller quantity of bitters. Ginger beer can be used in place of the ginger ale. This entry was posted in Atelier Vie, Barrel-Finished Reserve, Recipes, Toulouse Red. Bookmark the permalink.